Bar Fly - Does My Bomb Look Big In This? Here are two more bars from the resident Bar Fly, Rebecca Varidel. Catch more of her musings on Inside Cuisine. DUCK INTO THE secret tunnel entrance, and descend the stairs to a bouncy, underground sandstone bunker bar in one of Australia’s oldest warehouses in The Rocks. On opening night this BAR FLY consumed their first glass of wine, Cake Wines Rose, and watched this pop up bar fill to capacity within its first hour. It’s enough to make the morose John Malkovich happy. 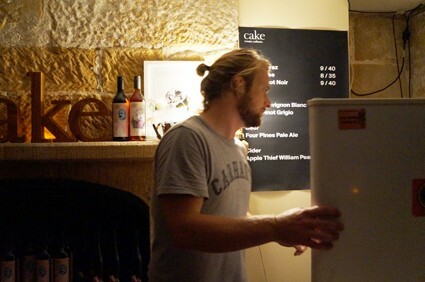 Adelaide Hills Cake Wines Shiraz, Rose, Pinot Noir, Sauvignon Blanc and Pinot Grigio by the glass or bottle, Four Pines Pale Ale, Apple Thief William Pear Cider and pizza are all on offer. Online bookings available through Facebook for nightly events - such as Dumbo Feather: Conversation series with John Polson creator of Tropfest (13th February), Valentines Day, Lovebombs (fall in love on 16th February) or Tropfest Afterparty (17th February) - and for closing night party from 5pm on the 2nd March. WHILE THE EXTRA top shelf spirits listed in the Downstairs Bar and the popular classic cocktails were enticing, the Saturday night birthday celebrations of our large group started with carafes ($28) of The Common’s Spritz (Aperol and Prosecco with slices of fresh cut citrus, orange blossom water and soda). Then we pretty much stuck to NSW beer: Lord Nelson Three Sheets Pale Ale ($8). Someone ventured further with a Bloody Mary, which was tasty after he fought his way through the garnish: fresh chilli and cucumber slices as well as the traditional celery. We appropriated the open-air front courtyard with its wooden crates: upturned as low tables and oue seats. Table service enabled our chitchat without disruption - very good fun. However next time I’ll try different bar snacks or share plates, as The Commons’ Ploughman’s was a lesser species.